Hey there! I don’t know about you, but I LOVE Sofilantjes Patterns. Sofilantjes (Anne Jacobs designer) has some AMAZING patterns and techniques which makes them so much fun. I always find that the patterns allow people to become creative, without actually having to imagine up anything by themselves because Anne has already done all of the hard work! I love being able to use patterns for multiple different looks, so sometimes I like to play a little with the pattern. The Sylva Top and Tunic is already a great pattern, with multiple necklines available. There is a V-neck/V-back option, or a hooded option. 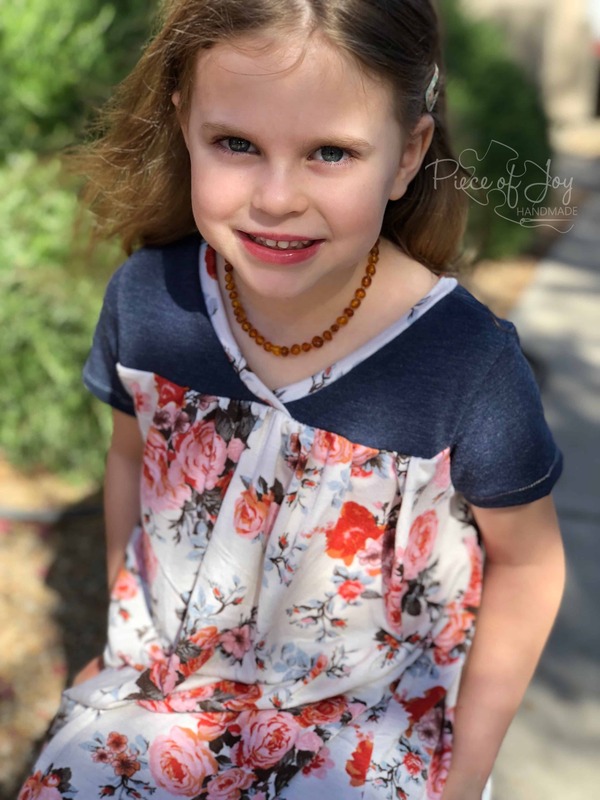 I love the V-neck/V-back option because my 4.5 year old can put it on forward or backward without me needing to turn it to the right side! I wanted to use a Rayon Knit blend for this, but knew it didn’t have enough recovery to the fabric. Here comes the fun. I made the front and back bodice piece gathered, so the flowy rayon would work. Print out the pattern based on the measurements of your child. Make no changes to that. You can do a tunic or a shirt. The length will not be altered. Cut every piece out according to the directions, EXCEPT the front and back bodice piece (same pattern piece). Sew two basting rows (Long, straight, gathering stitches) on the top portion of the front piece. Pull the gathering rows, and gather the fabric to fit the top portion of the bodice. Attach the gathered bodice portion to the shoulder portion, and sew as directed in the directions. Repeat for the back. Continue with directions as normal, and be sure to remove any basting stitches that are visible. Hope you found this helpful! Thanks for reading!